One of my most fond childhood memories is eating fresh pecans with my grandparents. It seems like that always had fresh pecans. It was because, until recently, they had multiple pecan trees in their small, suburban yard. I remember the excitement & anticipation as we cracked open the pecans and dug out the treasure inside and hurriedly popped the “meat” into our mouths as fast as we could. Sometimes, however, in our rush we would fail to remove all of the bitter encasing of the nut, and our faces would turn sour. If you haven’t had that experience, it is one of the most awful tastes you will experience. It’s something you will not forget quickly. As I was reading another blog post yesterday, I had a similar sensation. The article was well-written and very informed. Yet, when I began reading the comments, I felt my mouth becoming increasingly bitter. It was like getting another bite of those pecans, which we had not taken the time to clean thoroughly. One great philosopher & theologian once said, “Man who stick foot in mouth repeatedly get athlete’s tongue.” While I say that with humor, the essence is true. Jesus said, “I tell you, on the day of judgment people will give account for every careless word they speak, for by your words you will be justified, and by your words you will be condemned” (Matthew 12:36-37). Yes, we all make an occasional mistake and speak things that we regret later. However, if we repeatedly speak in ways that are cynical, exaggerated, belittling or boastful, we will eventually become the product of our own fruit. We, ourselves, will become a cynical, arrogant fool before we realize it. Paul said, “a little leaven leavens the entire lump” (1 Corinthians 5:6). It creeps up on you before you realize it. This is especially true for those of us in the Messianic Restoration. We can’t help it. When we finally understand the implications that Jesus (nor his disciples for that matter) did not come to establish a new religion called “Christianity,” but sought to reform the biblical religion of Judaism as the long awaited Jewish Messiah and all of the implications that come along with that — when we finally “get it” — it’s like someone has finally pulled out the box top of the puzzle we have been working on for all of these many years and waived it in front of us just long enough to get a glimpse of our goal. And from there, we frantically start throwing the pieces of the puzzle together and make more progress in one hour than we have in the last five years of looking at it and scratching our heads. It’s not like we have a perfect snapshot of the entire, finished puzzle. However, we at least know that the pieces we were using for the grass actually belong in the trees, or vice versa, and have somewhat of an idea of how this hodgepodge of pieces was intended to be arranged. It’s just natural to start telling people that their pieces don’t fit together and don’t look anything like the box lid. So… Through much personal failure, I have learned that silence is golden, until I know I have a receptive soul. It has kept me from “dumping” on people and pushing them away. It has actually, made people come to me asking to know more about my faith and practice. Personally, I think the Messianic Restoration is a powder keg near a hot flame. I think that all the world is waiting on is for Messianic believers to really start living out our faith (i.e. majoring on the majors, and minoring on the minors), and there will be a major spiritual revolution that will sweep across our land. But the world will never see that until we prove that we are genuine disciples of the Master through our love for one another (John 13:35), rather than our castigations of one another. And if you disagree with someone and would like to persuade them toward your line of reasoning, there are better ways to do it than berating them. 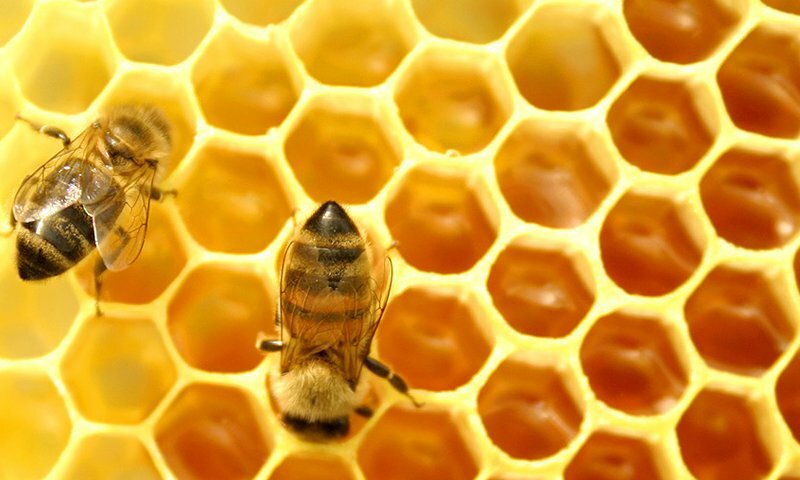 The old saying that “You can catch more flies with honey than vinegar” is true. I really have no idea whether it is true in the sense of literal flies, but I know it to be true in its analogy to human nature. It has proven itself time and again. Shlomo HaMelech (King Solomon) said it this way, “A soft answer turns away wrath, but a harsh word stirs up anger” (Proverbs 15:1). If there is one lesson I have learned from people like Boaz Michael (“still learning” is actually a better description) is to be gracious with others, respect others, listen to others, and love those who don’t agree with you. The bottom line is that “people really don’t care how much you know, until they know how much you care.” Our love and good deeds (the actual living out of the mitzvot — “commandments”) will speak more than anything we could ever say in trying to convince anyone of the how we see things. It is our fruit that people see, rather than our roots. And if our fruit is rotten, what appeal is there in that? I wake up each morning pretty much the same. My alarm goes off on my phone, I walk to the other side of the bedroom and hit the snooze button. I lay back down for another five minutes until my alarm goes off again. Annoyed by the fact that it’s only been five minutes since it went off last (intentionally), I question why I have my alarm set to this often insane time so early in the morning that I question whether the Almighty even knows about this hour of the day or not. At that point I am reminded of why I have to beat this earthen vessel into submission: to be a true disciple of my Master. So, I say Modeh Ani (the prayer upon rising, thanking the Almighty for another day of this life), get dressed (sometimes) and make may way to my office at the other end of the house (not very far away in my 1400 sq. foot home). Often I’ll make a cup of tea (Chai, Oolong, Early Grey) or coffee (decaf), and then begin my morning study routine. I first pray the Hareini Mekasher (the prayer for binding oneself to Yeshua as my Master and the Righteous Messiah), then recite a long portion of the Sermon on the Mount (memorization exercise), then move on to study several other things — mussar, Torah, the Gospels, Paul, Torah Club, Daily Dose of Torah, chasidic commentary/insights, contemporary writings among my peers, views that are opposed to mine, blogs, etc.. I’m not saying I study every single one of these each morning. However, I will gravitate toward a particular topic or three, but maintain my “core” sources in the mix. After that, I try to write. And although I haven’t posted daily on my site, I do try to write at least something each day. Currently, I’ve been very focused on my discipleship book. I have intentionally reserved my site for what I consider more important, complete thoughts, rather than filling it each day with my stream of consciousness that seems to be prevalent among most blogs (and arguably which is actually more of a blog anyway). My choice in this has been to spare people my ramblings, my rants and my questions and offer a few nuggets here and there which may be of value. From there I spend time in Shacharit (morning prayer) and then begin my work day. Anyway… a few weeks ago, the eldest daughter of one of my best friends painted a picture (above) for her family of a burning lamp with a couple of scrolls in the background. 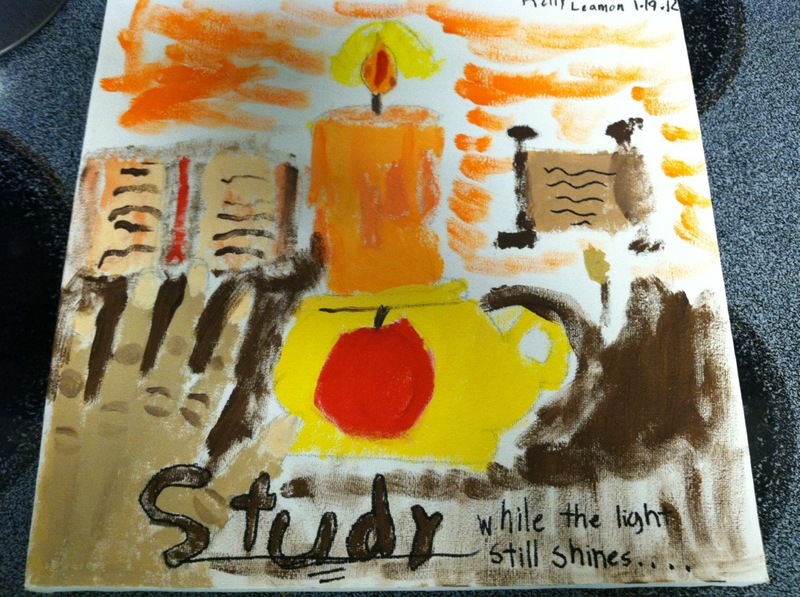 Her caption reads, “STUDY while the light still shines…” Her father made me a copy of it, and I hung it in front of my desk yesterday. It will serve as a constant reminder of why I have to beat this flesh into submission, rather than getting the extra hours extra sleep that most people would enjoy. 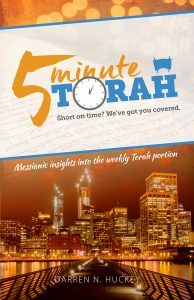 The sages say that one of the first questions we will be asked by the Holy One in the world to come is, “Did you set aside fixed times of study?” (b.Shabbat 31a). Whether this is true or not is not my point. We should make it, however, as important to us today as it was at the time of the disciples. Where the disciples had the Torah-made-flesh as their instructor, today we mainly have the written works of others to guide us. Some of us are fortunate to actually walk in the dust of a great teacher to whom we have been taken under their wing. Most are not that fortunate. So, until we have that opportunity, studying the writings of holy men and women who have walked this journey ahead of us is our primary means of staying the course and molding our minds into godly vehicles by which we convert information into action, thoughts into deeds. It is in these times of concealed, un-noticed self-discipline that our minds, hearts and souls are transformed. It is this preparatory work that tills the soil for hearts that are receptive to the work of the Almighty during the day. It is this preparatory work that I enjoy sharing with my close friends, knowing that they, too, are seeking the Holy One daily. Don’t get me wrong. This isn’t a boast feast. I have nothing to boast in. I struggle daily with submission. My point is this: I’ve been writing a lot about discipleship. However, it doesn’t mean beans if I’m not living it. So, I’m throwing the ball back into your court: Are you actively making effort daily to be a better disciple of Yeshua? When Yeshua returns, I want him to be able to look at me with loving eyes and say, “Well done, my good and faithful servant.” What about you? Does your daily routine leave room for discipleship? Discipleship – Is the Problem Jesus or Me? I am constantly amazed at the various depictions of Jesus in popular and religious culture. 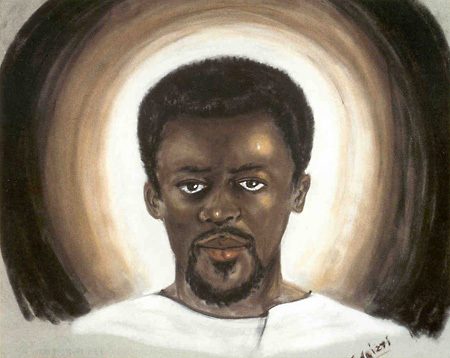 It seems there is a “Jesus” for every ethnic group and every activist organization on the planet. I’ve seen depictions of Jesus that portray him in every shape, form and fashion. I’ve seen a European Jesus, an African Jesus, an Oriental Jesus, a Zoroastrian Jesus, a Catholic Jesus, a hippy Jesus and even a dinosaur-cuddling Jesus. It seems everyone has a desire to in some way identify with this man named Jesus. It is true. Even the religious leaders of non-Christian religions have an affinity with Jesus. In the last few decades, there have been an increasing number of Jewish scholars and authors who have taken up with Jesus. Orthodox Jewish scholar David Flusser devoted some sixty years of his life to studying Jesus. Jewish author & Dead Sea Scrolls translator Geza Vermes has had a fixation on Jesus for nearly four decades as well, publishing more than a dozen books on him. More recently, other Jewish scholars such as Mark Nanos and Amy Jill Levine, have added to the discussion. Even more recently, television show host, author, and rabbi Shmuley Boteach has published a book entitled, Kosher Jesus, which has caused quite a stir in the Jewish community. Leaders of other religions follow suit. Mahatma Ghandi is quoted as saying that he liked Jesus and his teachings. In fact, he frequently quoted him and referenced his parables. Ghandi was attracted to Christianity at an early age, and even considered becoming a Christian. 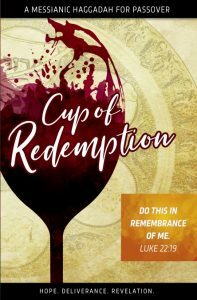 It all fell through, however, when a representative of Jesus, a “Christian,” put a bad taste in his mouth that he would never forget. During India’s struggle for independence from British rule, a man named Mahatma Ghandi, The Mahatma, as he was known, (Mahatma, means “great soul”) pioneered the use of active, but non-violent resistance as a means of achieving his goal of freeing India. It was well known that in his struggle for independence, Ghandi often quoted Jesus’ sayings and parables from the Gospels, and was especially fond of the passage in Matthew’s gospel that we call “The Sermon on the Mount.” Yet, he was not a Christian and steadfastly rejected any suggestion that he become a Christian. Ghandi’s rejection of Christianity grew out of an incident that happened when he was a young man. During his years studying law in Britain, he had become attracted to the Christian faith, had studied the Bible and the teachings of Jesus, and was seriously exploring becoming a Christian. One Sunday, in South Africa where he had gone to practice law after getting his degree, he decided to attend a church service. As he came up the steps of the large church where he intended to go, a white South African elder of the church barred his way at the door. “Where do you think you’re going, kaffir?” the man asked Ghandi in a belligerent tone of voice. Ghandi appreciated and admired Christ, and even considered following him. However, a single mis-representative of Jesus destroyed his opportunity of ever becoming a believer. Ghandi had a high regard for Jesus, but like many others he was not fond of Christians. Because, according to him, Christians are not anything Jesus. There is hardly a Sunday that goes by where a teacher or preacher doesn’t make the claim that people can’t stand for Christians to talk about Jesus. “Everything is good, until you bring up Jesus.” Is it really because of Jesus? Or is it because the only time they hear about Jesus is in the context of a high-pressure, evangelistic sales pitch from hypocritical Christians? Contrary to what we claim in our churches, the aversion people have to Christianity is not Jesus; it is Christians. So much so, that there is a documentary entitled, Lord, Save Us From Your Followers, which tries to answer this specific question. I believe if we are honest with ourselves, the example of Ghandi is an an accurate reflection on our current status as disciples of Jesus. As a whole, we aren’t doing so well. It’s time we change that. 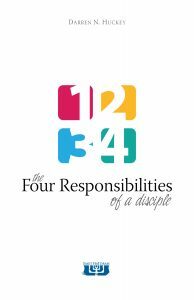 Author DarrenPosted on February 4, 2012 April 17, 2012 Categories DiscipleshipTags Beatles, discipleship, Flusser, Ghandi, Jesus, Kosher, Levine, Nanos, Shmuley Boteach, Vermes1 Comment on Discipleship – Is the Problem Jesus or Me? This is not at all in sequence with my previous posts. However, I had to get this out while it was fresh on my mind. I live in the Bible Belt. As a matter of fact, I live in the Bible Belt Buckle. There’s a church on every corner, and it seems that most people profess at least a cultural connection to Christianity. They are a member of one church or another, whether or not they’ve attended in the last twenty years. They are still at least somewhat concerned with conservative Christian values. They generally place a strong value on family and have a good work ethic. Sure, we definitely have our share of agnostics and atheists (personally, I don’t believe they exist), but predominantly, most people around me are in some way connected to the church, whether they have strong convictions in any particular biblical value, or have even picked up a Bible in their lifetime. I call this Cultural Christianity. Ouch! A vampire Christian? Yes – that hurts. But truth is often revealed in pain, because it breaks us out of our personal utopia and forces us to confront reality. I know that no one in their right mind would consciously say these words. However, Willard has uttered here the subconscious thoughts of all Cultural Christians. He has exposed the heart of those who would invoke the blood of the Messiah in order to wash away their sinful past, but continue to walk in stride with a life in which the Risen Lord has no place. Paul tells us that if we have life in the Spirit, then our daily walk (life) should also be “in the Spirit” (Galatians 5:25). If we are walking on our own path, rather than following in the dust of our Master, it should give us pause. Are we a “vampire Christian”? Have we insulted the Spirit of grace (Hebrews 10:29)? Has our Cultural Christianity lulled us into a spiritual coma from which we cannot awaken? The gift of grace through the blood of the Risen Messiah is entirely free. Yet it cost Jesus his very life. Shouldn’t we at the very least give ours back to him, rather than merely feeding off of his blood?